Escobar: Paradise Lost opens with a dramatic scene: Pablo Escobar, the most notorious drug kingpin of the modern age, is calling his mother from a heavily guarded hideaway in the mountains of Medellín, Colombia. It’s the night before he’s scheduled to turn himself in to the authorities under a deal with the Colombian government. After struggling for reception on his unwieldy phone—an absurd scene not unlike grandpa adjusting the antenna on his old tube TV set—Escobar gets down on his knees and asks his mother to pray with him, and pray for the family his illicit business supports. There’s vulnerability and fear in his voice, but most of all, there’s a heartfelt sincerity that belies his record as a mass murderer, capable of legendarily heinous acts. 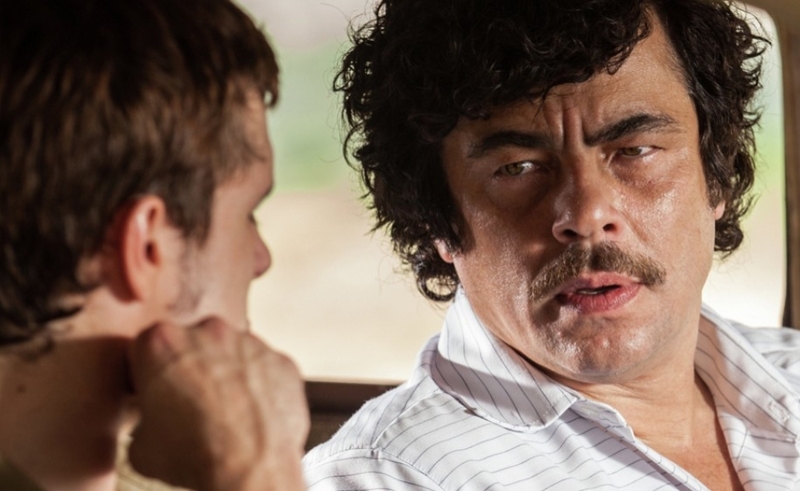 Escobar’s close relationship with his family and Medellín’s poorest residents is what makes him such a fascinating figure, and Benicio Del Toro, ideally cast in the role, suggests how his contradictory impulses were able to co-exist. Escobar: Paradise Lost is about a white Canadian who married one of Escobar’s nieces. And while the forces of history are sometimes best expressed from the eyes of those steamrolled by them, it’s a fatal misstep on the part of writer-director Andrea di Stefano—an actor making his directorial debut—to assert this dim naïf as a smart avenue for defining Escobar and his legacy. At best, the film could be said to use him as an example of Escobar’s capacity for leading a dual life as patriarch of two families, his cartel and his blood relatives. It also shows how his loved ones denied the uglier side of his business, so long as he kept it from view. But Escobar: Paradise Lost takes such a limited view of this multi-faceted figure that it fails as portraiture, and the real center of the film is too much of a bland good guy to compensate. Played by Josh Hutcherson with the same stiff-jawed earnestness he brings to Peeta in The Hunger Games, Nick has ambled into this region of Columbia to teach surfing lessons alongside his brother (Brady Corbet) at a makeshift operation near the beach. Nick makes the mistake of falling in love with Escobar’s niece Maria (Claudia Traisac), who works as a nurse in a hospital that stands as one of Escobar’s many philanthropic ventures in the area. Maria is aware of what her uncle does for a living, as is Nick, but they remain deliberately blind about how he does what he does. When they get married and move to one of his haciendas, however, Nick starts to learn more troubling things about the family business, and he eventually can’t keep a safe distance from it anymore. Escobar: Paradise Lost chooses a strong framing device: With Escobar scheduled to go to prison, he chooses his closest confidants, including Nick, to scatter his ill-gotten fortune in hiding places around the region. But getting to that payoff is a grind, because so much of it’s spent on Nick’s dawning realization that Escobar’s unsavory activities are forcing him into moral compromises that cannot be easily escaped. None of this says anything about Escobar, other than his ability to intimidate and coerce the people closest to him, and it mostly just deepens the impression that we’re watching the wrong person. It’s like watching a concert film where the only camera angle is from the upper deck.